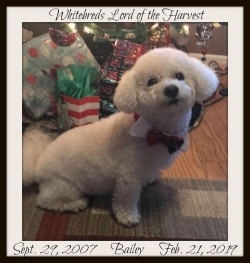 Whitebred's Lord of the Harvest (Bailey) born September 29th, 2007 sadly passed February 21st, 2019. 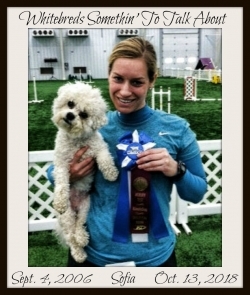 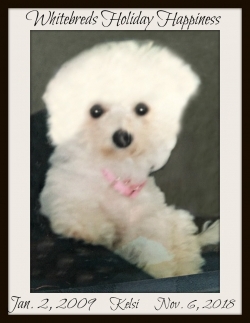 Whitebred's Holiday Happiness (Kelsi) born January 2nd, 2009 sadly passed November 6th 2018. 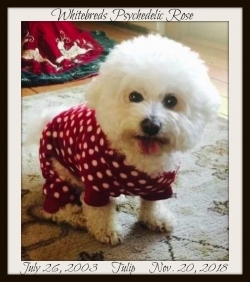 Whitebred's Something to talk About (Sofia) born September 4th 2016 sadly passed October 13th 2018. 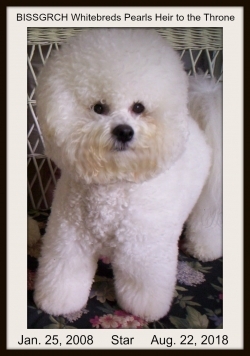 Bissgrch Whitebred's Pearls Heir to the Throne (Star) born January 5th 2008 sadly passed August 22nd 2018.